At the beginning of May Joakim and Ulrika travelled from Stockholm to Texas and Luna - in part three Joakim, Ulrika and Mike head to Houston. Part one saw them in Dallas and part two in Austin. You can see a list of all Joakim's previous posts for A Head Full of Wishes. The waitress looked over her shoulder making sure no one else was close. She leaned over the table and lowered her voice. "Go ahead just take them", she said with a funny smile. She quickly went away to pick up another order of pancakes. 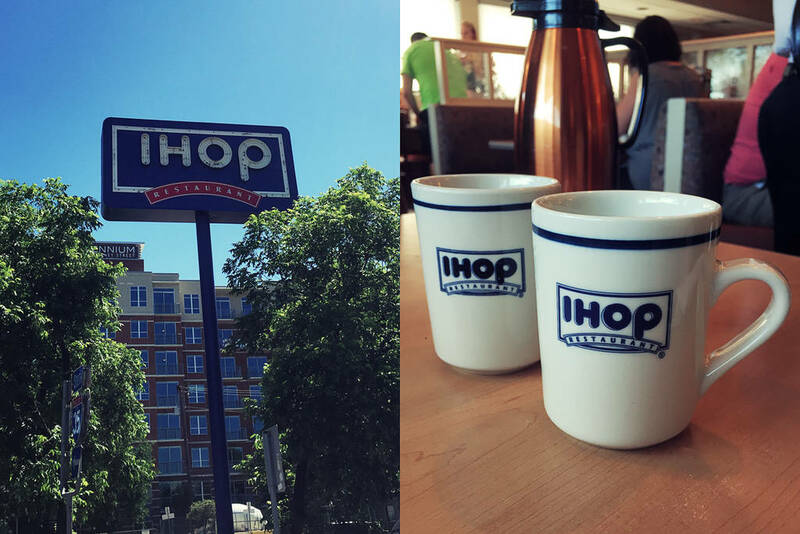 We got IHOP mugs for free, at International House of Pancakes. We left, full of pancakes, happy and free. The vegetation was green, probably because of the heavy rains a few weeks before. A shooting range, big ranches, commercial signs everywhere, still pretty and nice. I was surprised. This wasn't how I had imagined Texas to be. It almost felt like I was in a tropical land, but with shooting ranges. When it wasn't green, I kept seeing purple shades in the landscape outside the passenger's seat window. It was purple, I have never seen purple shades, but I did. Then I removed my sunglasses. Blue Thunder really struck me like it never has before. Songs about cars should be heard in a car at least once. While the purple shades were rolling by outside the windows, we listened to all sorts of music. With a certain theme. 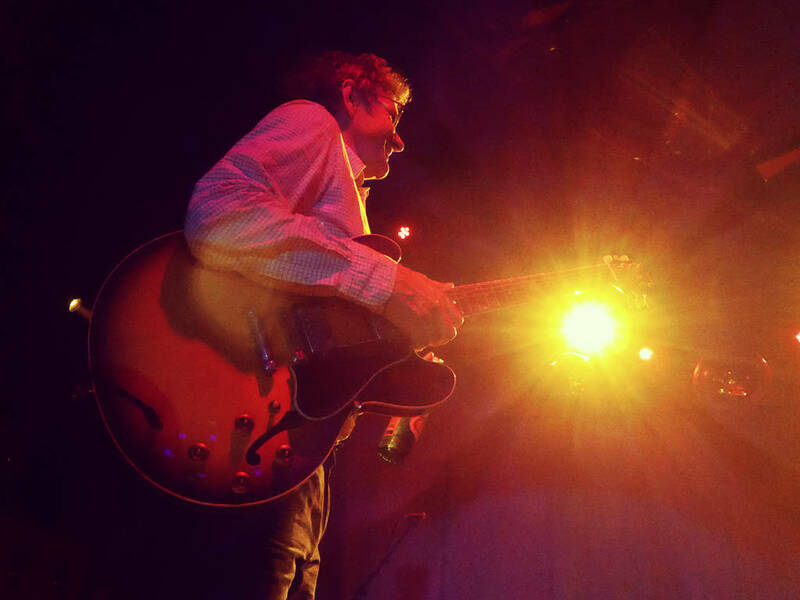 First, we got to hear Dean Wareham play Galaxie 500 songs from Barcelona a few years back. The guitar mixed so high it almost sounded like an electric solo record by Neil Young. It was beautiful. Blue Thunder really struck me like it never has before. Songs about cars should be heard in a car at least once. I almost cried, to lyrics like "look how fast it goes, my, my blue thunder". I love this art form. We listened to a Dean & Britta concert recording and Britta's voice on You Turn My Head Around got me goose bumps sharp enough to cause a flat tyre. We stopped for a break at a lavender farm in Chappell Hill. Turned out to be no lavender bloom at all, just two goats partying on hay bales, but we got some lavender bathing salt. We got into the small town of Chappell Hill, it's just one street. Someone selling tiger lily soap. I had a sniff. Met a guy that was handing out free samples of honey, the best honey I've ever had. The honey man asked about our identical Luna t-shirts, that Mike had made himself and sent to us as a gift. Mike explained shoegaze music to him, "they stare at their feet while playing". "Luna is not shoegaze", I intervened. They have too much fun. Got into a saloon, it looked like a saloon to me, packed with people eating barbecue, squeezed me in between two cowboys, ordered an ice cold beer, drank it on the porch, it felt good. The Houston skyline wasn't far away. And there it was. Skyscrapers reflecting in each other. Pulled up the driveway, handed the car keys to the hotel staff. Had a seat by the pool and relaxed. Surrounded by magnificent sky scrapers. Ulrika sat down for five seconds. "No time to rest", she said. "Let's go!" The taxi driver was probably over 80 and the funniest ever. Beautiful clear sky, palm trees along the street, and this big grey building. 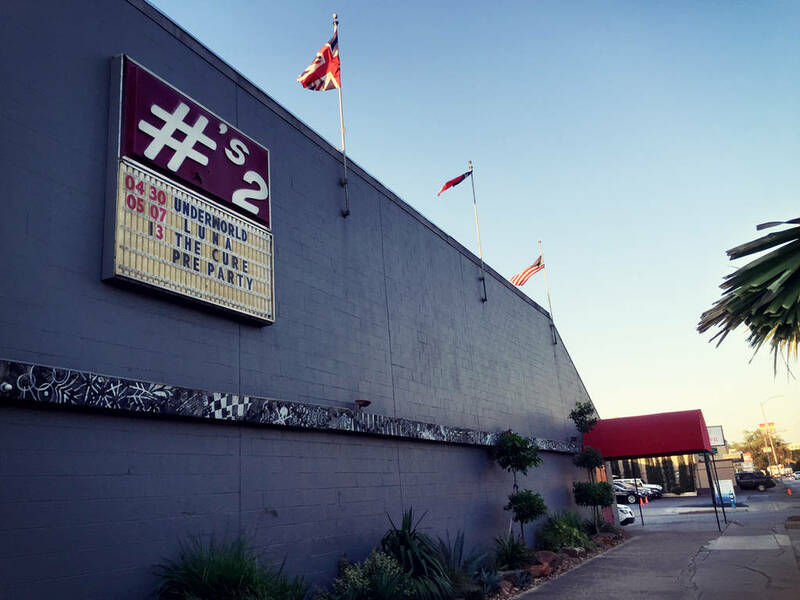 Numbers is a classic venue in Houston, it's been there since 1979, the year I was born. 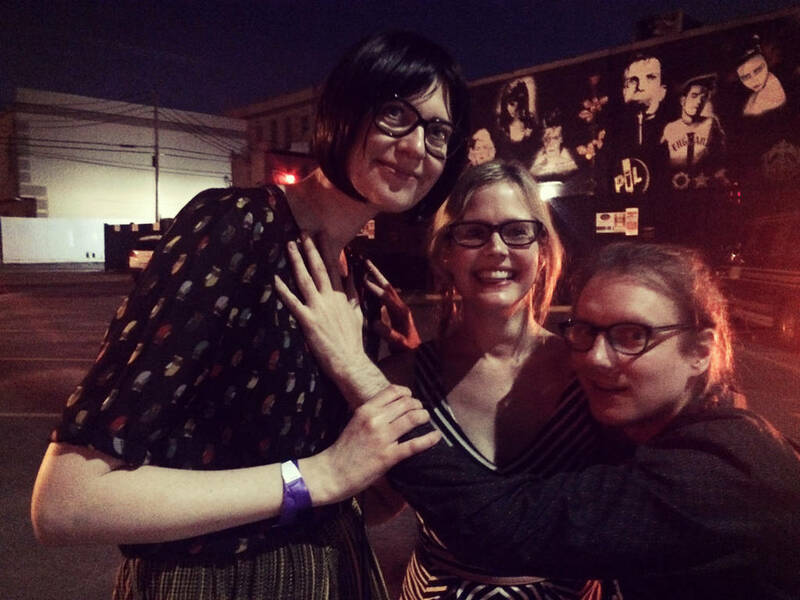 Met Lee and Britta outside, telling us there was an issue with the soundboard, so it was going to be delayed. I like Luna concerts that start late, it tends to be a wilder affair. We headed to the Mexican place next door to wait, Ulrika went to stand in the line. She saw a young homeless man sitting in front of the entree, drinking beer from a brown paper bag. She went right by him. Turned out he was first in line. Then they became friends. The venue opened the doors half an hour late. Like always, we talked to all the nice people, including the "homeless" man, his name is David. Joe and Ilene were there too, telling us stories about when they used to go to Numbers. Local band Wild Moccasins was the first opening act, with a charismatic singer who fluttered around on stage, in a loose red dress with dots, two large knots in her hair. It sounded fabulous. Disco balls and varied flashing colours. The stage has a step up on the floor just next to the stage, the worst idea ever. A guy walks up to us, he's standing right behind us, between us, like a maniac. We turn around. It is Dean. He's staring right at us from below, with a little smile. We started laughing in surprise. "Let's see if it will be just as good as yesterday", I said, because it was indeed a fantastic show in Austin the other day. Very fun, energetic, and the sound was perfect. Three young women walk up to Dean, almost in ecstasy, taking pictures, highly astonished to see him in the crowd, in the very front. More people gather around, it's fun to look at, I get a picture of the young women, that turns out to be a mother and her two daughters. Fooled me. A guy walks up to us, he's standing right behind us, between us, like a maniac. We turn around. It is Dean. He's staring right at us from below, with a little smile. 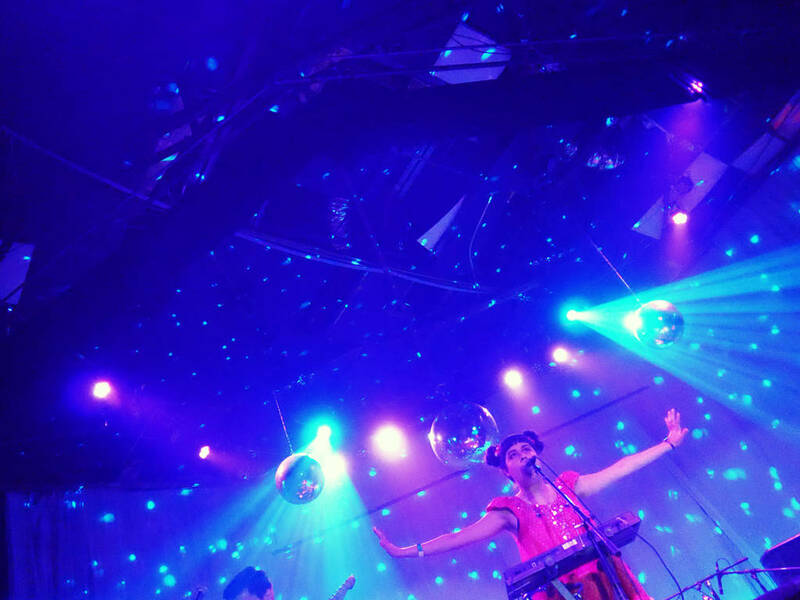 The disco balls hanging from the ceiling spread their light over Britta and her band. Playing one more perfect gig, same set list as before and crowd applauds and shouts. Daydream is her James Bond theme song, it could be anyway, that she wrote about when she joined Luna 16 years ago. It's slow but powerful. And it's I'll Keep It With Mine again, I don't mind hearing that one at all, it's lovely. The lyrics are brilliant. "I can't help it, if you might think I'm odd. If I say I'm not loving you for what you are, but for what you're not." Dylan spent time together with Nico in Paris 1964 and they travelled around, he wrote many fantastic songs on that trip. To Ramona, Mama You Been On My Mind, and this one among others. He gave the song to Nico for her to record on her album Chelsea Girl. But Britta's version is completely different, inspired by the band Rainy Day. 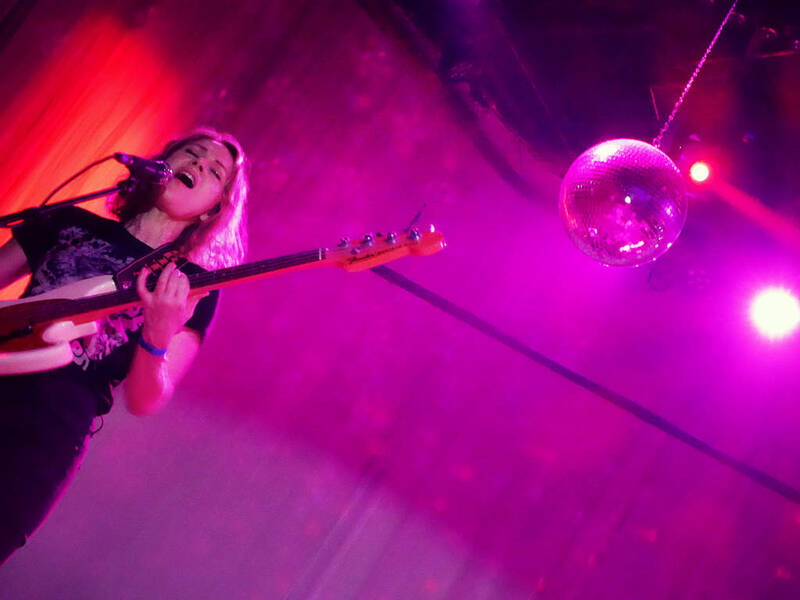 Britta is also singing Dennis Wilson's song Fallin' In Love. It has that cool Californian summery feel that goes so well with Britta's personalty. And Drive, everything is beautiful with this song. It's night time in the Californian summer. The stage light is dampened, everyone is dead silent. "You can't go on, thinking, nothing's wrong." Her voice is so powerful, cool, sweet and powerful. "Who's gonna drive you home, tonight." Again, she has really found her sound, it's perfect. I go and see how Mike is doing, I try to guard his equipment so he can take a break. The sound woman is helping him out already, he seems to be relaxed. But I know that he is bit nervous, if someone is gonna kick the stand and ruin it all. There's usually no issues luckily. Dean is very happy when he walks up on the spacious stage, walking around with his new guitar. Instead of his white guitar or his green ones that he usually uses, for these Texas shows he plays on a semi acoustic brown and yellow guitar, or historic burst that is the more fancy color Gibson calls it. For those interested, it's probably a 1959 ES-335. I wouldn't want to drop it. He is constantly smiling before they start playing, walking to the front of the stage, to the sides, back again, always with a big smile on his face. His hair is strongly back lit by the spotlights moving all around. Sean is standing close to his amplifier, getting ready. Britta wears sandals. Lee tries to avoid scandals. Suddenly a tall man with messy hair walks up on stage, says "Luna, this is Houston. Houston, this is Luna" looking as cool as only Terry Tolkin can. I'm beginning to see the light. It's not exactly perfect, but it shouldn't be perfect all the time. I write down a note on my phone, it says "it sounds awful, awfully good"
I look at Ulrika a few seconds into the first song. We both hear it right away where we are standing it the front. The sound is different, again. Mike was right. This is shoegaze. It is not the same Slide that we heard in Dallas. It feels like it's slower, a big blurry fog is approaching us. We are highly pleased. Speedbumps is the same, but a lot faster of course. It's not exactly perfect, but it shouldn't be perfect all the time. I write down a note on my phone, it says "it sounds awful, awfully good". Chinatown is smooth as silk, the up-speeded end part is like a mind massage. But the band seems a bit distressed. Both Britta and Sean are either standing close to their amplifiers or stepping inwards towards each other, concentrating, with Lee in the middle not folding an inch. They are even talking to each other between songs. Dean is in the front of course, like always bending down to adjust his little knobs of his pedals. He doesn't seem to mind about the sound. He just moves on. Joking with the audience. Doing high five with someone standing next to me. Inviting a girl up on stage, she wears a white old Luna t-shirt. Sean used to go to high school in Houston, he goes on about how he used to come to this place in the 80's, "hanging out and dancing to whatever New Wave tunes there was". "Did you get married, when? ", Dean asks a girl in the audience when they start playing This Time Around but stop because of feedback. "18 years ago", she replies. They restart and it's perfect. It's a short direct sweet pop song, I can't remember if they released it as a single. They play almost the same songs they played in Dallas a few days earlier, just in a slightly different order. It's a big venue and it's not sold out, but the audience is having fun, you can easily tell. The light is astonishingly beautiful. The strong lights from the spotlights are moving around a lot on stage, changing in blue, red and yellow. The disco balls gives a warm cozy feeling to the night. Sean and Dean go on talking about Billy Idol for a minute or two. Lee starts Tracy I Love You. Also a lovely pop song. There are many. It rises in intensity with a Sean Eden guitar solo at the end, or is it Dean? Can't remember. "Some people talk like babies, some people say nothing at all." Moon Palace. We still haven't heard all the songs from Penthouse yet, Hedgehog for example, we will hear it sooner or later. Dean asks if there's someone in the audience who went to school with Sean. No one says a word, it almost never happens during a Luna show. I don't know why but I raise my hand and Dean sees me. "I know he's from Sweden" he says laughing a little. 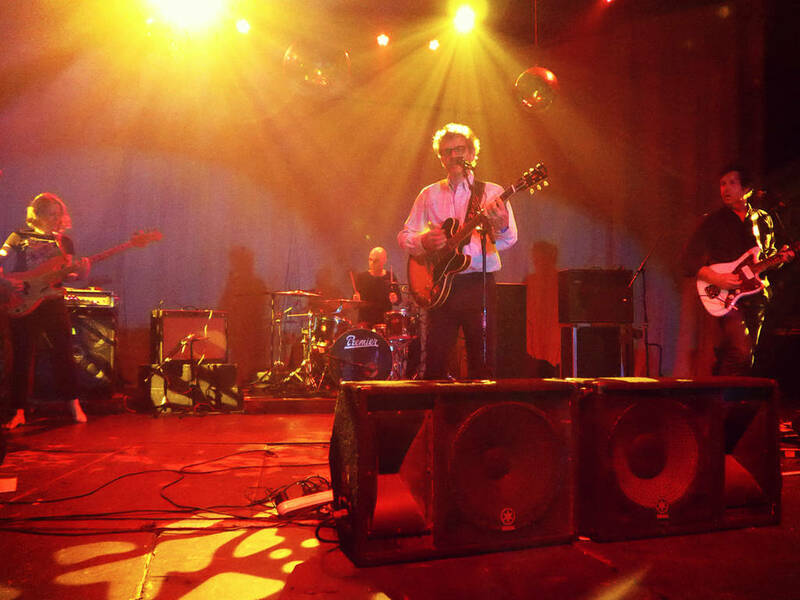 They play Bewitched and Lost in Space, two slow songs that both grow in intensity as they go on. 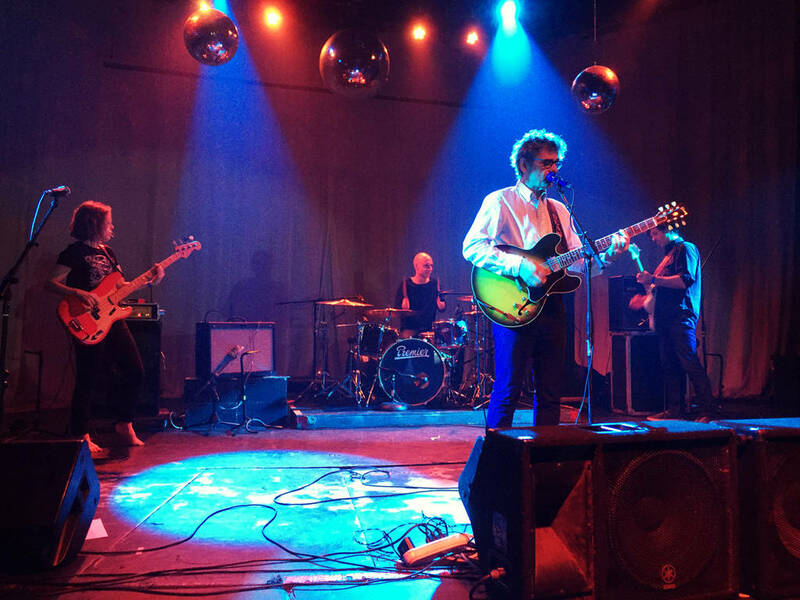 "Thank you so much for coming to see us", Dean says before finishing the main set with the upbeat Friendly Advice, another one of those definitive songs, they mix in a little psychedelia, sounding a bit like The Grateful Dead, but with a much steadier beat, it's Lee Wall on drums. They come back and starts jamming on a song that I can't identify, "we haven't practised it so we can't play it", Dean says and they go with Tiger Lily instead, playing it safe, probably a smart choice. Suddenly one of the speakers placed on the stage pointing towards us is starting crackle heavily. I want to pull the plug but of course I don't. For the first time I go to the back of the audience, and the sound is much better. Kelly and Ashley comes up to me saying they also heard it, and we are watching the show together standing at the back. It sounds rich, big, compact, energetic, tight, smooth, pretty much perfect in every way. A guy in front of us is waving his arms back and forth to 23 Minutes in Brussels. We find it funny and cute at the same time. For a second I wish it would be me. It's the last song of the show, it's as great as ever. 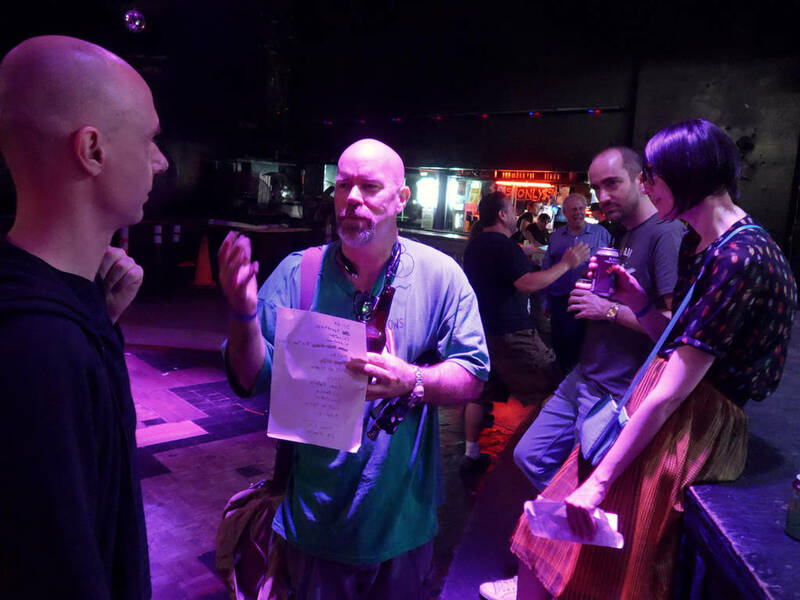 Lee comes up to us after show and hands over his setlist to Ulrika, I was almost a little moved by it. Terry Tolkin picked up the set lists after the show and handed them out to random people in the audience, which I liked a lot that he did, because not only the people closest to the stage had the chance to get one. It's impossible to get them all the time but we collect the set lists after the shows if we have the chance, both to keep as a memory but mainly to post a picture of it on A Head Full of Wishes. In Santander, Spain last year I got one signed by Dean to give to Ulrika. She was too shy at the time and didn't even want to show herself. Dean signed it and I told him "my boss will be so happy". One of many bad jokes I've said on these trips. There will probably be a few more. We are sticking around after the show by the stage, talking to everybody, Lee is talking with Mike about drummers. I don't follow them, I know nothing about drummers. But I remember hearing Bob Dylan once introducing his drummer by saying "the only drummer that is better than no drummer at all". Hardly the truth, but it says quite a lot about how important it is to have a good drummer. Lee is one. Britta comes by and takes us backstage and I ask her a million questions. She is eating her "good quality chocolate" that she always puts on the rider to be in the dressing room. Apparently she also loves beans, cocoa beans. There are only good beans. There's a bowl of fruit. And a bottle of wine or two. She breaks off a piece of the Lindt, takes a bite. They didn't have time for dinner before the show she tell us. I babble about boiled peanuts. Dean comes in. I wonder what he wants in the dressing room. Probably nothing. Sean's white Fender Jazzmaster is placed on the small couch, standing up on one of the couch seats, it's beautiful. I place myself next to it. And I know I shouldn't do it, but my hands picks up the guitar and I hear myself strumming a D chord, it's still in tune, and even not plugged in it has such a nice and clean tone. Sean is fortunately not in the room. I promise to never do it again. I take a picture of Mike with Britta and Dean. 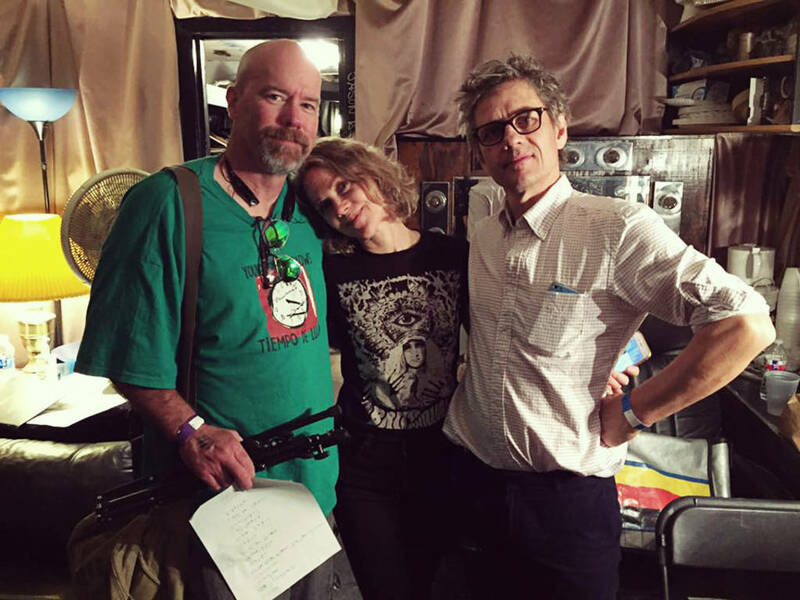 Britta is leaning her head on Mike's shoulder, it's a sweet picture. I think it looks a little sleepy so I strike them all lightly in their stomachs to enliven the situation. Ulrika just shakes her head probably preferring I wouldn't have done that. I wonder why they keep inviting us, but I really like talking about chocolate with Britta. We stay in the parking lot and Dean sees Ulrika and walks up to her and gives her a good bye hug. It's nice to see but it feels a bit sad. It's time to leave, we have seen the last concert on this trip. Then they drive away, the tail lights disappear in the dark. Seeing them play together again is making our lives much happier. We are glad they are touring again, wherever they play we will go and see them. Kelly's taxi takes off without her, we are talking too long. She has been lovely to us, always with her welcoming smile. We've been to many of the same concerts before but strangely never met until now, I'm glad we finally did. We say goodbye, saying we will meet again soon. Me, Ulrika and Mike go back to the hotel, it's late, and there's more than an hour wait for the pizza delivery to the room, but we don't mind at all. We are just about to start listening to the concert again. I didn't feel like getting to sleep that night. Four in the morning I started to write a letter to Britta, as an excuse I asked if she wanted pictures I took from her concert and signing at Waterloo Records in Austin the other day. I also told her that I got goosebumps that almost had us a flat tyre when listening to a live version in the car of You Turn My Head Around. And I wrote a bunch of other stuff. She replied the next day, didn't seem too offended luckily. "Thanks for coming to Texas and thank Ulrika too", she wrote. They were going home to rehearse for the new Andy Warhol shows. We were about to leave as well. Said goodbye to Mike, I got a lump in the throat, I don't like goodbyes. He went to a baseball game and got hooked up with a couples daughter. Good for him. We went for a walk in Downtown Houston, had a Mexican meal and then found a tiny kiosk in a street corner selling local beer. Three charming young black girls working in this tiny space, they seemed to have so much fun. We talked about Beyonce, she was born in Houston. They didn't go to the her concert the day before, same night as Luna played. But they were a bit sorry it was her last show ever according to them. One of the girls, the one with braces, started singing in the microphone used for calling out orders to those on the seats outside. Everyone laughed. It was hilarious, we didn't want to leave Houston at all. Be we had to. We called a taxi and I found out I had forgotten my jacket in the room, so I went back and got it. In Manchester, England last year, Britta told me it was a nice jacket and asked what brand it was. It has five buttons instead of the usual two. It's warmer that way, and it looks nice. It was so worn out that I couldn't use it much more. So I don't. But in Bangkok earlier this year I had a copy made. The shoulder pads are now more Talking Heads in its style than the original, but that's fine, I like Talking Heads. And that was the jacket I forgot. The friendly cleaning lady gave it back to me smiling. I said thanks to her and the staff. "It has been lovely in Houston, it's such a warm and welcoming city." I really ment it. Then we jumped into our taxi heading for the airport. "We are going to Terminal D", I told the driver. "As in Dean. You know, the bean." Seeing them play together again is making our lives much happier. We are glad they are touring again, wherever they play we will go and see them.